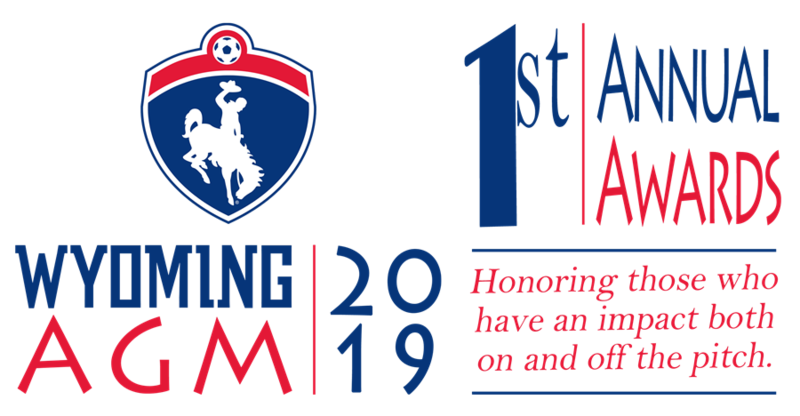 Nominations for the following awards will be open annually prior to the Wyoming Soccer Association (WSA) Annual General Meeting (AGM) and are open to the entire membership. Help us recognize the many outstanding individuals in a number of capacities who make youth soccer possible. Outstanding play can also be recognized in two categories. WSA winners are announced at our AGM. Winners of these awards at the state level are advanced for further consideration at the Regional level (US Youth Soccer West Region). Regional winners are considered for the National awards in each category, which are presented at the United Soccer Coaches / US Youth Soccer annual workshop. *Please note there are MAXIMUM guidelines to make a nomination, but no MINIMUM guidelines. There are two Referee of the Year awards given each year (young referee (18 years or less, and referee (over the age of 18)) who demonstrate ability, willingness to learn and enthusiasm for refereeing youth soccer. The nominees must regularly referee youth games in WSA-sanctioned events. Nominations are due in the WSA office by January 18, 2019. Nominate a Young Referee of the Year. Nominate a Referee of the Year. There are four coaching awards at WSA: the Boys and Girls Recreational Coaches of the Year and the Boys and Girls Competitive Coaches of the Year. For each award, the nominated individual should show a very high level of dedication to teaching the game to young players and should demonstrate a commitment to the future of soccer in the state. Nominations are due in the WSA office by January 18, 2019. Nominate a Coach of the Year. The Administrator of the Year Award honors extraordinary accomplishments in administration over a multi-year period (at least 3 years). This award is for the person who works in the office or the hierarchy to get the children onto the field in as efficient and rewarding a manner as possible. Nominations are due in the WSA office by January 18, 2019. Nominate an Administrator of the Year. The Volunteer of the Year award honors those who work tirelessly behind the scenes to make soccer fun and rewarding. Willingness to promote players and soccer, sound moral and ethical character and increasing the opportunities to participate in soccer are all characteristics of nominees for the Volunteer of the Year award. Nominations are due in the WSA office by January 18, 2019. Nominate a Volunteer of the Year. The TOPSoccer Buddy of the Year and Coach of the Year award honors an individual making outstanding contributions to the TOPSoccer program for young athletes with disabilities--bringing the opportunity of learning and playing soccer to any boy or girl who has a mental or physical disability. Nominations are due in the WSA office by January 18, 2019. Nominate a TOPSoccer Buddy of the Year. Nominate a TOPSoccer Coach of the Year.